Unpleasant and disturbing throughout - but makes for compelling listening (if you have the stomach for it). Best track is "Gacy's Place" from pioneering Chicago punk group The Mentally Ill. Since the early '80s I've been seeking out weird-looking compilations of '50s and '60s music. I've amassed a reasonably large collection. I found this one for £5 in a second-hand record shop in town. 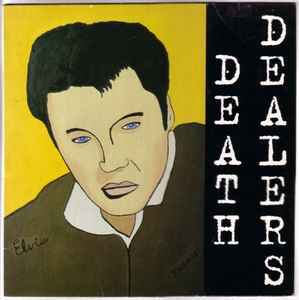 It ticks all the boxes of strangeness: a badly designed cover (painted by a serial killer, naturally), a tracklist of sinister stuff and an unpleasant title; "Death Dealers". What makes this comp even weirder, apart from the music, is the creepy interviews with various mass killers interspersed between tracks. Personally I have next to no interest in serial killers, but if this is what gets you going then this is the comp for you. The best actual song on the thing is probably Eddie Noack's Psycho - but you don't really buy this type of comp for the music, do you? weird. Why is this banned? Is it because it's a bootleg or due to its content?